Valhalla The Scillies lies forty miles from the tip of Lands End and on the charts this group of 145 islands resembles a handful of large boulders scattered into the sea by an angry giant. With fierce seas, strong tides and often blanketed in fog, the Scillies has a fearsome reputation as a ship killer and its rocky shores are littered with more shipwrecks than anyone can truly count. However when the Scillies are not wrecking ships, it is blessed with a beautiful sub tropical climate and its Botanical Gardens on Tresco are world famous. Tucked into a small corner of the gardens is Valhalla, a collection of ships figure heads, gathered from the unfortunate shipwrecks that have been smashed to pieces on the Scillies unforgiving shores. Here are just a few of their many stories. The Bishops Rock Lighthouse stands at the western gate of the Scilly Islands and has been witness to many shipwrecks, but the four masted Liverpool barque Falkland managed to strike the lighthouse itself. Loaded with grain, the Falkland, built in 1889 for the Palace Shipping Company and commanded by Capt. Gracie was 135 days out from Tacoma when she encountered a severe south westerly gale which broke some of her mast stays. Driven towards Bishops Rock she struck the lighthouse broadside on, one of her huge masts striking the lamp tower itself. The gale blew her of the rocks and as she drifted to the north, twenty five of the crew and the Captains wife and young child managed to escape in one of the ships lifeboats. Capt. Gracie wasn’t to be so lucky. He led the rest of the crew to the other boat but it was jammed on its skids. By the time they got it free the Falkland fell beam on to the waves and sank like a stone, drowning him and the rest of the crew. In the days of sail derelict ships often became a navigational hazard. Overwhelmed by storms the crews often fearing the worse would take to the ships lifeboats only to find later after they had been rescued that their ship still floated, and that they had been too quick off the mark.One such case was that of the Norwegian barque Sophie of Frederikstad carrying a cargo of coal from Swansea. She was sighted on the 15 December 1896 dismasted and wallowing in heavy seas off Shipman head. Ten local men put out in a gig to board her and found her completely derelict except for a well fed dog. The cabin was laid up for a meal, the clock still ticking and half prepared food warm in the galley. It was as if everybody had vanished which is in fact what had happened. Dismasted with the ship leaking badly and thinking they were about to smash onto the rocks the crew had abandoned the ship and been rescued some time later by the British steamer Glenmore who ended up taking them to safety in Gibralter. As for the Sophie she was towed to new Grimsby Sound by the Tresco and St. Martins gigs, the lifeboat and the Lady of the Isles where she was securely anchored. Unfortunately she was not worth saving so her hulk was sold to Algernon Doreen-Smith who ran a horticulture business on Tresco. He used the coal to heat his greenhouses and the wood from the ship around his estate in Tresco. The Bernardo was a barque of 701tons belonging to G.B. Degrogori of Camogli Italy. She was only thirteen years old, when in March 1888, loaded with ballast she was approaching the Scillies in a fierce northwest gale when her sails were torn to shreds. Finding herself helpless to manoeuvre she was blown ashore on the island of Annet. The ships lifeboat was launched but soon capsized in the heavy seas drowning all its eleven crew. Captain dapelo who was still trying to organize the other boat was forced to swim for his life, as the ship pounding furiously on the shore broke up underneath him. He managed to swim to the nearby Old Woman Rock, where he clung helplessly until he was rescued by passing fishermen. The Bernardo quickly went to pieces in the heavy seas, and all that was left was the figurehead. Rosa Tachini The Paper Ledges lie just north of the Nut rock, and it was here that the Rosa Tachini became shipwrecked after coming adrift in a savage south westerly gale in November 1872. 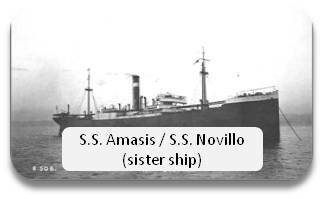 She was on her way from Buenos Aires to Antwerp loaded with hides, wool and tallow. She struck the ledges twice before settling on the rocks. She resisted being floated off and so became a total loss. The most seaward rock north west from Bryher is the Maiden Bower, and on her rocky crest many a ship has foundered, usually in thick fog. Around midnight on the 16 April 1894 fog again shrouded the Maiden Bower tricking the 1300 ton steamship Zelda into grounding hard and fast upon her. The Zelda, outward bound from Liverpool to Palermo was carrying a general cargo and some 32 passengers and crew when she struck. Luckily they all managed to abandon the vessel without mishap, and were rescued by two local Gigs who had set out from Bryher upon hearing the Zelda’s mournful siren blasts. Unfortunately the Zelda, which was on her maiden voyage, very quickly broke up and sank, and by the morning nothing remained to show that she had ever existed. However her Master Capt. 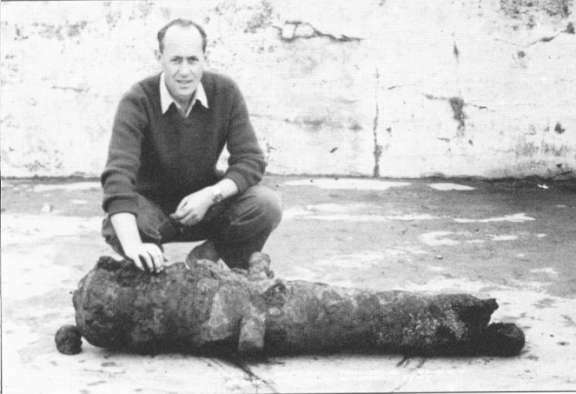 Pace was exonerated from any blame in the subsequent inquiry, and later almost all the Zelda’s cargo was salvaged by divers who worked successfully on the wreck for many weeks. The Zelda is an extremely good wreck dive and now lies in 50 feet of water smashed into pieces on the huge rocks and gullies that make up the bottom of this patch of seabed. Although well broken up there are still quite large pieces of wreckage scattered over a fairly wide area, and surprisingly there are still some brass bits and pieces left on the wreck. One of the main features is the Zelda’s large iron propeller still held by it’s A bracket. This is a most impressive sight and really sets the whole tone of the wreck dive. You can spend a very happy time poking around the wreckage, but if it starts to get boring you can move on to the other very strong feature of this site. The feature in question is a large gully that leads to a small hole just big enough to wriggle into. This hole turns into a tunnel that leads about 20 feet up through the rock face till you come out of another hole. It’s not at all dangerous, but it is very scenic, and makes for a great piece of diving. The most disappointing part of the dive was the absence of seals. All round the rocks were small colonies of seals, but they were obviously wary of us, so they did not join us in the water, which was a great shame because we had all been looking forward to diving with them. Anyone looking at a chart of the Scilly 1sles soon realizes that this small Island group is just one huge trap. Over the centuries well over two thousand ships have been wrecked around it’s trecherous shore, giving the Islands one of the greatest concentrations of shipwrecks anywhere in the world. The variety is quite staggering, ranging from H.M.S. Association, that celebrated flagship of Sir Cloudesly Shovel, to that infamous supertanker the Torrey Canyon, with just about every type of ship in between. From the divers point of view, the Scillies have those two compulsive indients, clear water and enough dive sites to beat all but the worst weather. Recently I spent a week vith Sub Aqua Scilly ( don’t think that’s running now ) diving on ten different vrecks, and all though all have their own facination, three sites really stood out, each in it’s own way demonstrating vhy the Scillies is such a wreck divers paradise. Unloading the Plympton. Photo Gibson Collection. The first site gives really good value because it contains two wrecks, the Plympton and the Hathor, one stuck right on top of the other. The Plympton, a steamship of 2869 tons was on it’s way from Falmouth to Dublin with a cargo of maize. On the night of 14 April 1909 she encountered thick fog, and with her foghorn sounding off at full blast she steamed full til t onto the Lethergus reef vhere she stuck fast. Her crew of twenty three were all landed safely and then the locals got down to the serious business of stripping the wreck. Unfortunately whilst work was still in progress, the high tidefloated the Plympton off the reef. whereupon she immediately turned over and sank, killing two men who were still inside the hull. The Plymton rolls over. Photo Gibson collection. Eleven years later the 7060 ton German steamship Hathor was being towed to Portland after breaking down near the Azores. As she reached the Scillies a fierce gale erupted which parted the havsers of her two tugs. 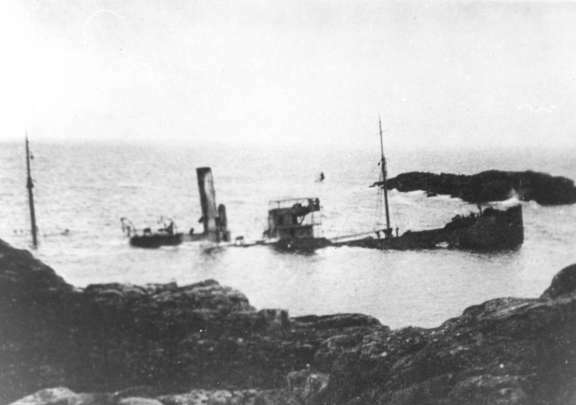 The gale was considered to severe to risk reconecting the tow, and so on 2 December 1920 the Hathor was abandoned to the storm and eventualy hit the Lethergus Rocks sinking right across the remains of the Plympton. The Plympton now lies in 120 feet of water on a very rocky bottom. She is well broken up, but her bows, although upside down are still more or less intact. The Hathor’s wreckage clothed in a profusion of large plumuose anemones is further up the reef in about 80 feet, and lies right across that of the Plympton. Underwater the wrecks present a tremendous sight. Both are surrounded by huge boulders and high rocy pinacles, and over the years they have become completely locked together. A huge iron propeller still connected to it’s shaft lies alongside a stern section still complete with it’s railings and a derrick. Spars and mangled iron plate lie scattered all around together with other large sections of wreckage. Further down in the gloom can just be seen the bottom of the Plympton’s bow. So jumbled have the wrecks become that it is often difficult to see where one starts and the other ends. With so much to see, a dozen dives would really be necessary to sort everything out which maybe explaines why these wrecks are so popular. The next wreck is out on the Golden Ball Bar and is of the 7176 ton Panamanian steamship the Mando. She was outward bound from Hampton Roads for Rotterdam, loaded with coal. On 21 January 1955 she lost her way in thick fog, ran aground on the Golden Ball Bar and quickly became a total loss. Now most of the Mando lies 50 feet down on a fairly flat rocy shelf, with her stern section further down in nearly 100 feet. All though well broken up the Mando still has a lot to offer in the way of large pieces of wreckage. The propeller shafts are particularly worth inspection as you can just about squeeze inside them. The most interesting part of the wreck however, is the remains of the engine room which overhangs deep gullies, making inspection of all it’s nooks and crannies very easy. All around lie large brass elbows from broken steam pipes, thick connecting rods, and all manner of other bits and pieces. The amount of brass on this wreck is really amazing. Parts of the wreck still contain all sorts of block ‘half’ bearings still locked around their shafts. Some are nearly three feet long, and all are made of solid brass. If you are a metal merchant or just an honest grubber, this wreck really should not be missed. The last wreck is that of the 3423 ton steamship Delaware, outward bound from Liverpool to Calcutta carrying a cargo of silk. The Delaware was smashed to pieces on the ledges between the islands of Bryer and Samson during an exceptionally savage storm on 20 December 1871. The rescue of her five survivors involyed carrying a lifeboat across one of the islands, and assumed such epic proportions, that eyen today it is considered to be one of the bravest rescues ever carried out. Even so it was not without a touch of humour. Two of the survivors, convinced that the islanders were savages, barricaded themselves on a beach and pelted their would be rescuers with rocks, untill persuaded that they stood more chance of drowning than of being eaten by the Scillonians. Today those ledges are named after the Delaware, and the remains of her wreckage now lie in 65 feet of water, well broken up except for the remains of the engine room which stands about 25 feet high. It seems to be on three levels, and since most of the sides are missing it is quite easy to swim around the large cog wheels and rods that almost fill the interior. At the very bottom, stuck away in a dark corner are three large brass elbows which despite considerable efforts still remain firmly concreted to the rocky bottom. The Delaware is not spectacular, nor is there a terrific amount of wreckage, so it is difficult to say quite why it is different. Maybe it’s just that , everyone seems to say off it, “what a good dive” and after all there cannot be a much better recomendation than that. In the past the Scillies have relied on wrecking to help support their community, and today the wrecks are still contributing to the island economy as a major tourist attractiot A visitor cannot escape from the sense of history that permeates the islands, and it is this experience of living history,coupled with the amazing variety of wrecks, which makes the Scilly Islands unique. The Blazer was an old steam tug of 283 tons. She had been built by S.M. Knight of Ayr in 1888. She was formerly called the Charm and operated out of Liverpool. She sank on the 10 November 1918 close inshore near the Conger ledgers. The wreckage of the Blazer now rests in about 30 feet of water on a reasonably flat bottom consisting of rock and fairly thick kelp. We hadn’t quite hooked into the main body of the wreck, but after a bit of searching we eventually found it. The Blazer, although not whole, is still in large recognizable pieces. The bows are virtually intact, and not far away lies the stern section, also quite well preserved. The boiler lies almost in the middle of the two sections, but slightly to one side. There is a mass of plating and other bits and pieces which provide a lot of scope for general rummaging around. But the main attraction is the intactness of this wreck. The conditions were very bad on our dive, strong currents and quite rough seas. So in calmer weather the Blazer should be even better. The fish life was a bit sparse, except for the wrasse which were there in quite respectable numbers and variations.